1 flour + pinch of salt + eggs + water ^ ^ .. Combine all ingredients together in large bowl until a soft dough. Pinch Coconut paste into small balls, and describe the balls in a large baking tray with a space comma between each ball and the other. Bake in a preheated oven at 180 degrees Celsius for a period ranging between 15-20 minutes or until golden brown. Section of the grill and a section for Mchakik ..
After spraying added garlic salt + yogurt + Almakhltp spices of turmeric, cinnamon and ginger crushed or grated green and black pepper, red pepper and a little onion powder (optional). At the same time have been set on fire. The work of this fire, dig a particular place in the form of groove surface is surrounded by brick and wood put it more equal and are set on fire and then we lined it sticks Almchakik control and heart until maturity. Are presented with Almchakik Syrup own or honey. 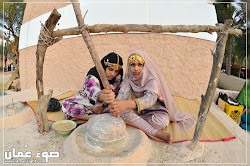 Despite the diversity of vocabulary culture kitchen of Oman and the annexation of a lot of names popular dishes such as "bridal" and "Almilli" and "Mash" and "mess" and "Alawal" and "Alsahnap" and "Alsidav" and "Alverwinp" and others, the "barbecue Oman "remains the single most special in that culture. The most prominent characteristic of this barbecue method buried underground for a day or two days in a deep hole beneath coals of wood "brown" Desert is blowing skill, especially the way down "Al_khasvp" made of palm leaves, containing pieces of meat large to settle on hot coals, Vintefi and the tone remains the flesh Bboukharh Almtkhalkhal to extend the banana leaves wrapped around the meat "marinated dressing," especially to mature over a day or two. Rituals and preparations And on a willingness to prepare barbecue Oman said Seller Tools preparations for the barbecue market in Seeb in the capital Muscat Hilal bin Saleh Al Zadjali of the island, Preparing for the BBQ starts the processing of "Altbzirp" a month before the Solutions Day is Bharat "seasoning" the flesh, and consists blended vinegar Oman made of dates pickles as well as cinnamon, ginger, Algeljlan or "coriander", garlic, black pepper, red, and "Triple" or "fennel" and salt, which left a "dressing" or "Altbzirp" for a month or two weeks prior to use. Shows that the approach of Eid moon is processing the hole up to two meters deep processing of wood with "brown" famous for his strong and slow Fahma Antvaih. And often each family dug their own and sometimes share a set of neighboring families in a single hole, where the crater wall painted cement or clay and fire is inside the wood until it turns to coals before landing inside the meat to be Coawh "Al_khasvp." And cover the hole when the barbecue lid prevents leakage of iron dust into the flesh. Meat is placed inside Al_khasvp to simmer over hot coals into the pit (IRIN) Al_khasvp Also be purchased Al_khasvp made from Palm, which reaches a meter in length and a half. On the first day of Eid "season" meat goats, sheep or cow mixing "Altbzirp" and placed branches banana in the depth of Al_khasvp, then put pieces of meat, followed by another layer of banana leaf or lemon leaves, and other pieces of meat and so on, and closed Al_khasvp thread of the fronds are landed at high speed and high-skill the bottom of the hole and covered with iron and is the burial of the meat is cooked with steam. And on the number of days of stay of barbecue underground explained Helal that this determined the type of meat, the meat was a goat - a favorite Omani - or sheep left in the hole for the day and night, any of the morning the first day of Eid to extract the meat morning the second day of meat flat good taste. The beef, which Tzbha large families, he needs often to two days deep inside the hole to a simmer well. He noted that the crescent is preceded by eating barbecue, "Almchakik" on the first day when the carcass, because barbecue is not ready to eat only in the second or third day. And Almchakik known in most Gulf States, Oman is not the same privacy as is the case with barbecue Oman, Oman is that Almchakik Choi using thin sticks of palm instead of "Sikh", and placed on hot coals without overt buried and eaten the first day of Eid. المظهر: بسيط. صور المظاهر بواسطة Brasil2. يتم التشغيل بواسطة Blogger.